Data from seismic networks needs better recognition, and its use by the seismological community needs to be easier to acknowledge. To support this, GFZ’s GEOFON data centre, in conjunction with the Geophysical Instrument Pool Potsdam (GIPP), helps network operators create Digital Object Identifiers (DOI) for their data sets. Many data sets in other research communities are also gaining DOI. GEOFON can create, or “mint” a DOI on your behalf. National libraries, data centres and other organisations may also be able to do this for you. If you choose to use another agency to mint your DOI, we recommend you stay close to the suggestions below. These recommendations are based mainly on the adopted FDSN Recommendation , but also seek compatibility with European recommendations like INSPIRE . FDSN’s mapping service  helps authors discover DOIs assigned to seismic networks. This document helps you understand the information we need to mint your DOI. As PI or operator, the DOI and its data is your summary of your data, so you want to prepare it just as carefully as you would an abstract to summarise a scientific article. On the surface, a DOI is just a label for an object, identified by a URL. (The actual DOI name is not chosen by you, but by the DOI publisher, or “minter”; if we do this, it will be of the form 10.14470/xxx98765.) But behind this label is associated metadata describing the object, such as its creators, descriptions and other relevant information, and references to related objects. These related objects may include other publications, such as a data report. (This “bibliographic” metadata should not be confused with the “seismic” metadata related to waveforms, such as the information in dataless SEED headers or Station XML, i.e. “inventory”.) It also includes a URL of a “landing page” on the Internet, which helps users learn more about the object. To prepare for DOI minting, you may need to gather some information to better describe your seismic network. This metadata is collected in an XML record defined by DataCite . The GEOFON data centre will use this with our existing inventory information (seismic metadata) to augment the network page describing your network. AUTHOR – the person or persons (or organisations) which should be seen as primary creators of the data of the seismic network. There may be more than one of these. For temporary networks we recommend the principal investigators and partners, while for permanent networks the organisations involved may be most suitable. YEAR – The year in which data were first collected. TITLE – A short name (5-10 words) of the network, experiment, or deployment. DESCRIPTION – A short “abstract” , no more than 200-300 words long. Include the number, location, and types of sensors, and the type of data collected. Suggested components: description, aim and scope – geodynamic setting – geographical coverage – instrument types and number – data policy (fully open/restricted/embargoed) – any other peculiarities of the network. CONTACT – Who should be contacted in case of need? For instance, if the data is restricted and someone would like to access to it. A global ID (e.g. ORCID [x]) would also be useful if the contact is a person. KEYWORDS/SUBJECTS – Put whatever description here including a link to the subjects/keywords. FUNDER – Institution that provided financial support for the development of the resource. Where possible we collect e-mail addresses and globally resolvable identifers (such as ORCID [orcid]) as these assist greatly in contacting and uniquely identifying contributors. Be aware that these will be collected by other data catalogues and services and may be spread widely. [Ensure that you have consent for publishing these details from all people mentioned.] You are welcome to discuss any privacy concerns about these with us. If you have related publications, or a data report, which the network’s DOI metadata should refer to, let us know their unique identifiers (DOI, Handle, ISBN, URL etc.). There is much room in the metadata model for additional information, and we welcome innovative suggestions about ways to use this. Information flow in the DOI world. Given a DOI name, “10.14470/asdfad” the landing page URL can be found. 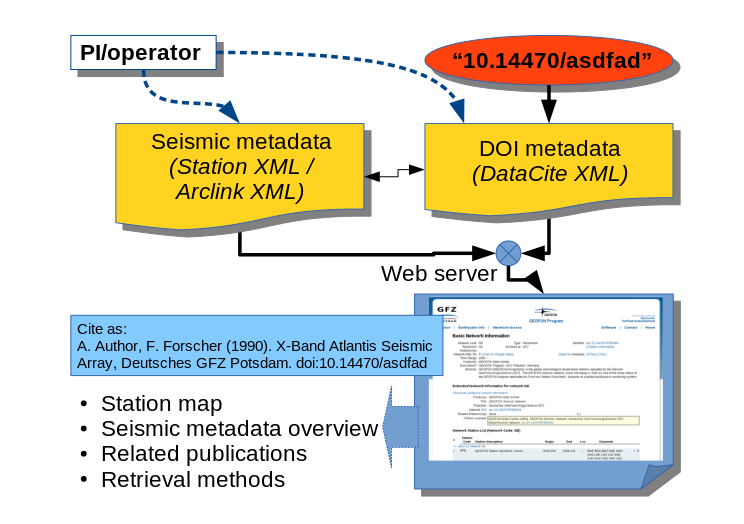 This landing page presents information about the seismic network which is compiled from two sources of metadata, and displays a recommended citation string. [footnote] The available roles in the Datacite schema v4.0 are: DataCollector, DataCurator, DataManager, Distributor, Editor, HostingInstitution, Producer, ProjectLeader, ProjectManager, ProjectMember, RegistrationAgency, RegistrationAuthority, RelatedPerson, ResearchGroup, RightsHolder, Researcher, Sponsor, Supervisor, WorkPackageLeader. A DOI will add visibility to your seismic network, and help you track citations of it e.g. at DataCite. Good quality metadata including a meaningful description will help others discover the data you have provided. Finally, don’t forget to encourage users of your data to complete the citation loop, by citing it using the DOI you have created! Q: What if I already have a DOI? A: Great, we will display it. To best promote your seismic network, you should use a single DOI for all citations of your data. Otherwise citations of your data might be split between two or more different DOI. Q: Does GEOFON own my data? A: No, the existence of a DOI says nothing in itself about ownership or usage. The DOI metadata should make clear who created the data/network, and what the role of each participant was. Q: What about restricted/embargoed data? A: A DOI’s metadata can (and should) contain a statement concerning licensing and usage rights. GFZ’s data policy  allows limited embargo periods in certain cases. Embargoed data can have a DOI. Please advise us when the embargo period is scheduled to end. © Copyright 2015-2017, GEOFON team. Created using Sphinx 1.2.2.